At first glance, it's hard to tell apart the ice cream served at a Taiwan cafe and living pooches. With deep wrinkles and puppy eyes, the gelato served at J. C. Co Art Kitchen in Kaoshiung are modelled after popular dog breeds labrador, pug, and Chinese Shar Pei. And customers can't bear to take a bite out of the icy treats. "It really feels like a real dog is looking at you," said a customer. Another said: "I feel like cutting into him will hurt him, I feel sorry for him." It's evident that a lot of attention was paid to the smallest details - such as the dog's characteristic wrinkles and sandpapery skin. 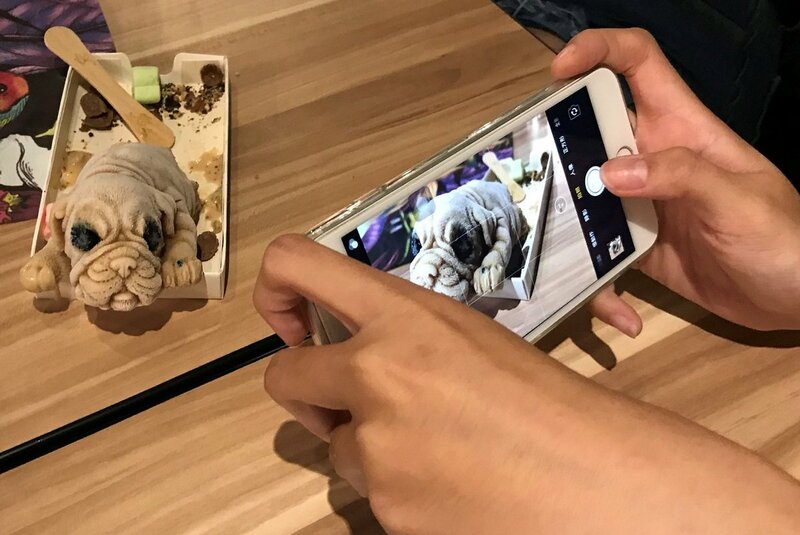 The lifelike puppy gelato is melting hearts in Taiwan this summer, and has inspired another cafe in Yilan to offer similar treats. According to local media reports, it takes J. C. Co Art Kitchen up to five hours to make 100 servings of the ice cream in a day. They come in three flavours - chocolate, earl grey, and peanut - and each costs between NT110 and NT188 (S$8.40). You'd better get your camera ready as this puppy ice cream starts melting minutes after leaving the fridge.